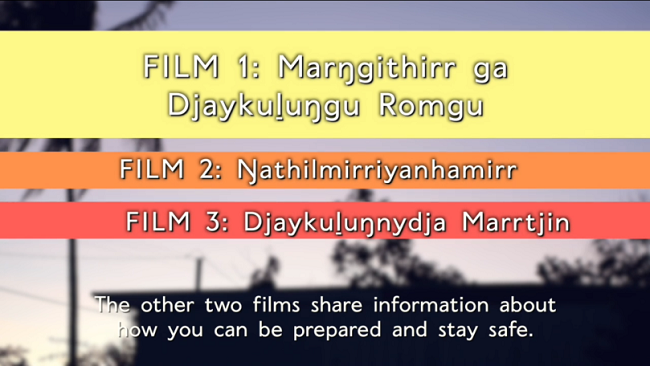 Three Cyclone Preparedness films have been produced in language to provide vital information on cyclone preparedness to the community of Galiwin’ku. Spoken in Yolngu Matha (with English sub-titles), the films were jointly funded by the Northern Territory and Commonwealth governments as part of the Tropical Cyclones Lam and Nathan Community Recovery Fund, under Category C of the Commonwealth-State Natural Disaster Recovery and Relief Arrangements. With input from the community, the Bureau of Meteorology, Northern Territory Police, Fire and Emergency Services and other regional stakeholders the films are the result of positive engagement in a cross-cultural educational space. View the Galiwin’ku Cyclone Preparedness films below – please note the links may need to be opened externally or on mobile.